Bethesda VP: Developing For PC is a "Headache"
Pete Hines of Bethesda says that between hardware hassles and piracy, developing games for the PC is a "headache." Bethesda Softworks has been around for a long time. My earliest Bethsoft game is Wayne Gretzky Hockey, which goes all the way back to 1988, and it's put out an awful lot of games since then. It's fair to say, in other words, that the company knows a thing or two about what it's doing. "We do what we do best. We make big, crazy RPGs and fortunately for us the previous ones have done really well so there's no reason for us not to keep making them," Hines, Bethesda's vice president of marketing, told Joystiq. "If that's what we loved doing and nobody wanted to play them, we'd have a problem on our hands." There was a time when those big, crazy RPGs were exclusively available on PCs, although that hasn't been the case since Morrowind came out for the original Xbox back in 2002. These days it's safe to assume that the bulk of Elder Scrolls fans get their fix via consoles, but while Bethesda still develops for the PC and shows no inclination toward stopping, Hines said it can be a bit of a hassle. "From a technical standpoint, yes, the PC is a headache. It just is. A million different possibilities of hardware, drivers, etc. As you saw with Rage, all it takes is some bad video card drivers and years of hard work comes off as 'buggy' when in fact it's a really solid, stable game," he said. And of course there's the old, familiar bugbear of piracy. "Unless you decide not to make your games available for PC, it's a problem and you have to deal with it," he continued. "So we do the best we can to protect it without resorting to Draconian measures, and we continue to enthusiastically support our PC fans with things like the Creation Kit and the ability to create and add unlimited amounts of mods and content to your existing PC game." 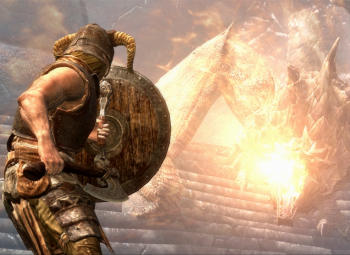 The Elder Scrolls V: Skyrim comes out on November 11 - that's tomorrow! - for the PC, Xbox 360 and PlayStation 3.